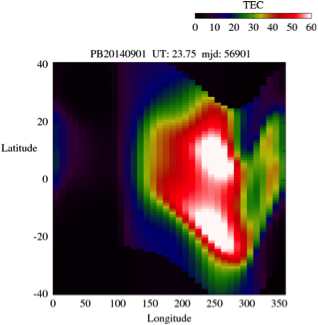 The PBMOD ionospheric model is a system of Physics Based MODels that describes the three-dimensional time-dependent evolution of the low-latitude ionosphere on several different spatial scales: globally it provides the plasma density and composition at altitudes between 90 and 2000 km; at finer scales it describes the development of fluid plasma turbulence within this region and the resulting radio scintillation. The numerical model of the ambient (global scale) ionosphere yields density distributions for electrons and several ion species (O+, H+, and NO+, O2+, N2+) as a function of latitude, longitude, and altitude on a prespecified spatial grid at specified times. The system also includes models that evaluate the growth rate for the generalized Rayleigh-Taylor instability, perform evolutionary calculations of the self-consistent nonlinear development of equatorial low-density plasma plumes/bubbles, and perform a phase-screen calculation to estimate the strength of amplitude and phase scintillation of radio signals passing through the turbulent structure. Numerous physical and chemical processes are contained in the model, including field-aligned diffusion, cross-field electrodynamic drifts, thermospheric winds, ion production due to EUV radiation, chemical and other collisional processes. The model uses the IGRF geomagnetic field model for an accurate depiction of the Earth's magnetic-field geometry. Depending on the inputs, the global ionospheric model can describe different solar cycle, seasonal, and daily variations. It can describe the low-latitude effects of geomagnetic storm dynamics. Global geomagnetic disturbance indices, Ap and Kp. L-band S4: for L-band (1500 MHz) signal. 1. To a large extent, the reliability of the calculated ionospheric parameters depends on the accuracy to which the global inputs have been specified. The ambient ionospheric model is particularly sensitive to the equatorial electric field (including both penetration and dynamo fields), but also depends on thermospheric winds, neutral densities, plasma temperatures, and plasma production rates. 2. The plasma plume model depends on the parameters in 1, and is additionally dependent on the choice of 'seed' or initial perturbation for plume development. 3. The structuring of the plasma in the turbulent plumes does not feed back into the ambient model. Retterer, J. M., D. T. Decker, W. S. Borer, R. E. Daniell, and B. G. Fejer, Assimilative Modeling of the Equatorial Ionosphere for Scintillation Forecasting: Modeling with Vertical Drifts, J. Geophys. Res., 110, A11307, 2005. Retterer, J. M., Physics-based forecasts of equatorial radio scintillation for C/NOFS, Space Weather Journal, 3, S12C03, 2005. 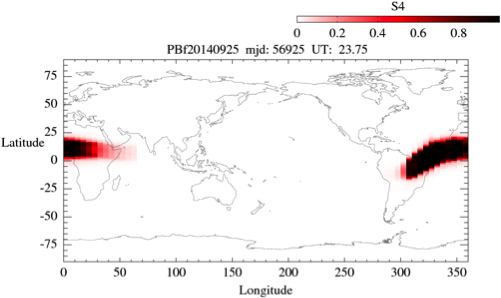 Retterer, J. M., Forecasting Low-Latitude Radio Scintillation with 3-D Ionospheric Plume Models: II. Scintillation Calculation, J. Geophys. Res., doi:10.1029/2008JA013840, 2010. Retterer, J. M., and M. C. Kelley, Solar wind drivers for low-latitude ionosphere models during geomagnetic storms, J. Atmos. Solar-Terr. Phys., doi:10.1016/j.jastp.2009.07.00,3, 2010.